Nestled into the coastal side of the Santa Cruz mountains, Butano State Park is one of the less traveled treasures of the Bay Area. Situated between Half Moon Bay and Santa Cruz, it's inconvenient location provides amazing trails and great solitude. According to their site, there are 40 miles of hiking trails in the 4,000 acre park. It also contains a few campsites in addition to a trail camp for those interested in backpacking. While generally less traveled you can still find beautiful views and amazing redwoods no matter where you go in the park. The trail system contains a nice mix of both singletrack and fire roads. Most if not all of the trails are quite doable. In my opinion while short, I think Gazo's Trail is some of the best single track in the Bay Area. Go check it out! Click here for the Butano State Park website with link to brochure and trail map. Click here for a direct link to printable trail maps. There are no dogs allowed on the trails in the park! The park has a campground that can be accessed. There is drinking water available at the ranger station but none along the trails. 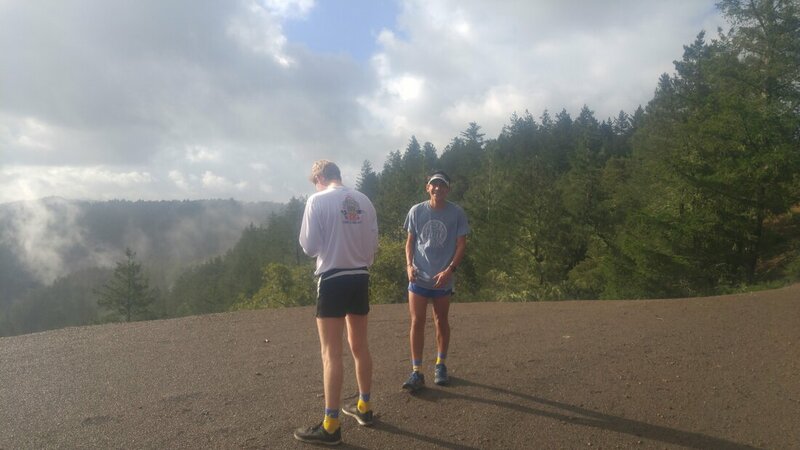 While not the largest and most well known park in the Bay Area, Butano State Park still provides some amazing trails in a great setting that often gets overlooked. This route goes around the whole perimeter of the park hitting some beautiful viewpoints and redwood groves. It is mostly fire roads but also contains some amazing singletrack. While the singletrack is short, I would argue that single mile of it is one of the best in the bay. Begin at the Ranger Station, there will be parking on the left hand side of the road in front of it. Begin by running up Jackson Flats Trail. 0.0 mi: Begin at the Ranger Station, there will be parking on the left hand side of the road in front of it. Begin by running up Jackson Flats Trail. The climbing starts now! 0.7 mi: Take a left on Mill Ox Trail. 0.9 mi: Turn right onto the South Butano Fire Trail. You will follow this file road for a while. 4.7 mi: You have reached the abandoned airstrip! Go right along the airstrip if you want to see some nice views, otherwise just continue straight on the fire road. 5.2 mi: Continue straight on Butano Fire Road. On the right hand side is the trail camp which has a pit toilet. There may or may not be toilet paper. 5.6 mi: Make a sharp right turn onto Olmo Fire Road. 7.8 mi: Tricky intersection. Take a left onto Gazo's Trail. It is a little hidden so keep an eye out for it. It is one of the best single track sections on the Peninsula in my opinion. 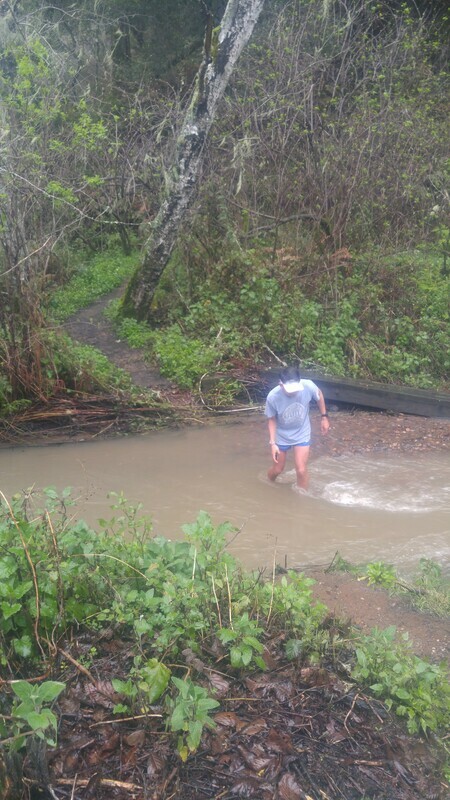 If you miss it don't worry, you will just stay on Olmo Fire Road and will end up in the same place. 8.5 mi: The amazing single track ends so continue straight back onto Olmo Fire Road. This climb will be the last one. 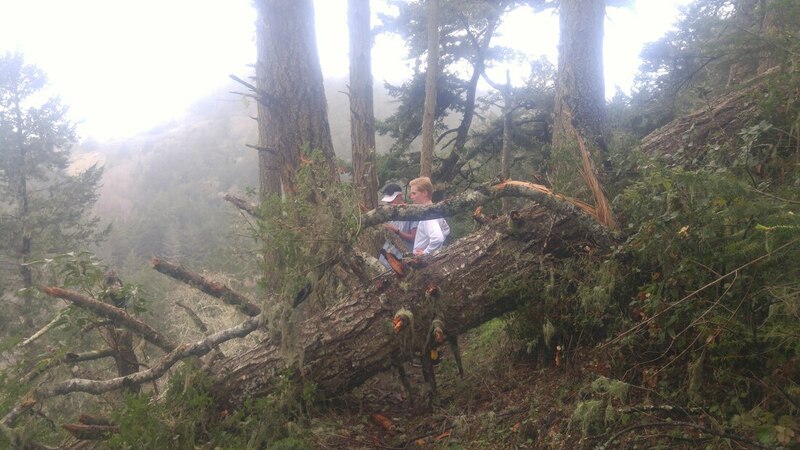 8.7 mi: Veer left off of Olmo Fire Road onto Ano Nuevo Trail. Climb a little more and then enjoy some more singletrack descent. Be careful, this trail is definitely slippery when wet. 9.7 mi: Turn left on the unmarked trail towards the Ranger Station. You will soon cross a bridge back to the road. The bridge is seasonal so you may have to wade through a creek in the winter. 9.8 mi: Back to your car!